Roatan diving is a big draw for people to this small Bay Island of Honduras. I know it was for us. We first went scuba diving in Roatan in the mid-1990's and loved it. For whatever reason, it was almost 20 years before we returned to Roatan. Talk about procrastination. However, we made up for it by staying for 3 months one year and another month the following year. I guess we still liked it there! Like many Caribbean locations, we saw enormous changes to the island in that 20 year time span - some good and some not so good. Roatan has seen a tremendous increase in the number of tourists and development on the island. It has also become a major stop for cruise ships with close to a million passengers per year. We tell you all about it in this guide - along with all the basic information you will need to start planning your own vacation to Roatan. 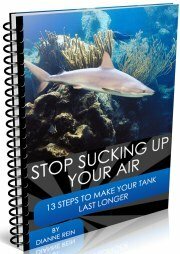 Whether you are a scuba diver or not. 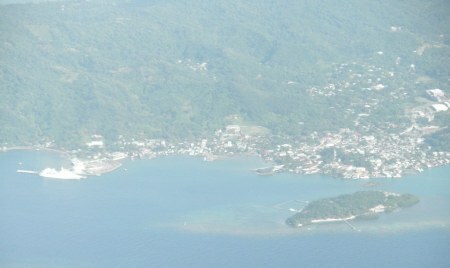 Roatan is the most developed and the largest of the Bay Islands of Honduras. Utila and Guanaja are the other 2 Bay Islands with any development of note. Roatan's landscape has something for everyone. Whether you like mountains, jungles or beaches you will find it on Roatan. Roatan's "backbone", if you will, is mountainous and affords beautiful views over the area. The shoreline around Roatan is dotted with beaches but it also has areas of rocky coastline. And, of course, the island has the second largest barrier reef in the world right off its coast (Australia's Great Barrier Reef is the largest) making it a huge draw for divers and snorkelers. 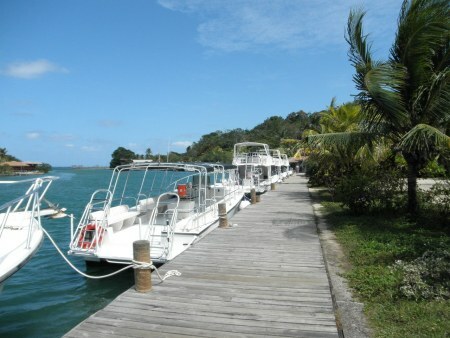 It also makes Roatan diving an important part of the island economy. The main area of development on the island and the area where most tourists will see is found on the western end of the island. Here you will find Coxen Hole, West End and West Bay. Coxen Hole is the largest city and capital of the department of the Bay Islands. A cruise ship dock and tourist oriented shops are located at the western end of town so tourists from the cruise ships will get a glimpse of the area as they leave on their excursions (another cruise ship terminal is located outside of Coxen Hole). Other than the cruise ship terminal, Coxen Hole is not very "touristy", it is more geared to locals going about their business. However, this is interesting in and of itself but it is all up to what you like. West End is the main tourist town on the island and is wall to wall shops. Here you will find beach bars, restaurants, dive shops, souvenir stores, etc. lining the small, dirt road running along the shore. When you see the amount of Roatan diving shops, it is easy to tell the main activity on the island. The town can get crowded and actually has traffic jams as cars/vans/delivery vehicles try to pass each other on the narrow road. An older view of the main street in West End - during an especially quiet time! And before the major road construction. There is a beach in town along Half Moon Bay but it is not as nice as the beach at West Bay. West End is popular place to stay for backpackers as this is where many budget accommodations are located. 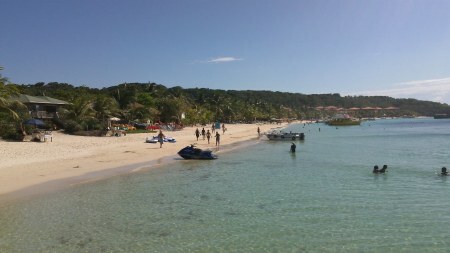 West Bay, further along the shore, arguably has the best beach on Roatan. There is development all along the beach but, as of yet, there are no high rises here. You will find bigger resorts, bars, restaurants apartments and dive shops on West Bay. The beach itself is a beautiful white powdery sand and the water is a wonderful turquoise blue. It is no wonder then that this a hugely popular spot with both cruise ship passengers and Roatan diving tourists. When ships are in town the beach can get very busy. Most passengers, however, have to start heading back to the ship by early to mid-afternoon and some tranquility returns to the beach. 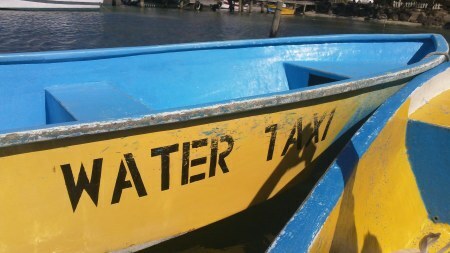 To get from West End to West Bay you can either take a regular taxi or a water taxi. The water taxi stand is located approximately in the middle of West End and there is a sign over the pier advertising the water taxi. Operators will probably call out to you as you walk along the road to see if you are looking for a water taxi. The ride takes about 5-15 minutes (depending on how fast your captain goes) and gives you a nice view of the coast and will drop you at one of two piers in West Bay. As of this writing, the price of the water taxi was US$3 or 60 Lmps per person one way. Roatan is fairly easy to get to and is served by several major carriers. You are able to catch direct flights to Roatan from Houston, Dallas, Miami and Atlanta. Major airlines which serve Roatan include Delta, United, American and TACA. United: Non-stop from Houston on Thursday, Friday, Saturday (2 flights) and Sunday. Delta offers non-stop flights from Atlanta on Saturdays. These were the only non-stop flights I was able to locate. Airlines appear to have changed their schedules with fewer non-stops into Roatan than in the past. That means the most hassle-free way of getting to Roatan would probably be to try and catch one of the non-stop flights listed above, even if you have to make a connection to get there. Alternatively, you could fly into mainland Honduras and then take a flight from the mainland to Roatan. The main cities to fly into would be San Pedro Sula, Tegucigalpa or La Ceiba. Airlines that service these cities include American, United, Delta, TACA, Spirit and others. From these cities you could then connect with a regional airline that flies into Roatan. Easy Sky is a relatively new airline and started operations in 2011. It flies between Roatan and La Ceiba and Roatan and San Pedro Sula. I haven't flown them personally but I have heard good reports on them. On one trip we flew American to San Pedro Sula and once in San Pedro we made our way to Roatan (via bus to La Ceiba and then plane from La Ceiba to Roatan but that's another story). Another option would be TACA into another country and then onto Roatan. They can have some good fares on this route. As of this writing, TACA has no direct flights from the States into Roatan. 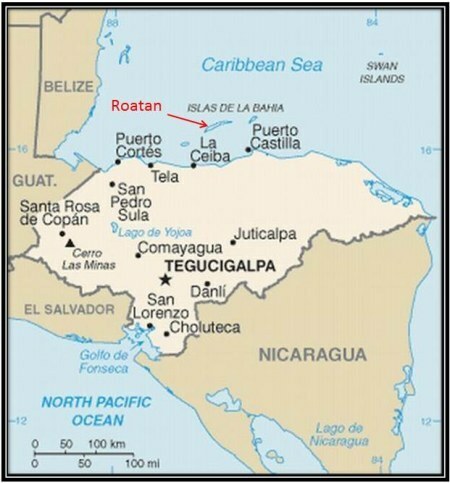 However, TACA flies into Roatan from El Salvador so an option on TACA would be Miami-El Salvador-Roatan. A friend of ours who was coming to stay with us for awhile took this route. She had no problems but nothing is guaranteed - especially when you start adding transfers to your route. Spirit Airlines also has a low cost flight from Fort Lauderdale, Florida to San Pedro Sula 3 to 5 times a week (varies depending on the month). However, the flight gets in at the ungodly hour of 1:40 am so you have to wait until morning for an ongoing flight to Roatan. Many people do take this route as it is usually is the cheapest option. It appears that most people elect to wait it out in the airport rather than get a room for a few hours after they arrive. From Canada, Sunwing operates a flight on Mondays from Toronto to Roatan. 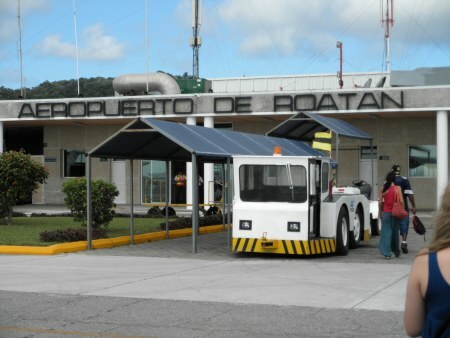 When you are leaving Roatan, you must pay an airport departure tax of approximately US$46. The tax must be paid in cash (lempiras or dollars) so be sure to save some money to get out of the country. There are ATM's at the airport if you find yourself short on cash when you are leaving. You can take a look at our partner's website to see if they have some good flights to Roatan that will suit your needs. 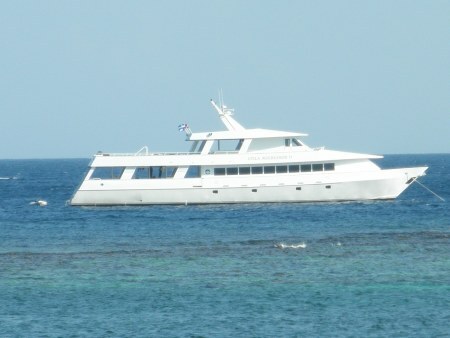 The Galaxy Wave is a 152 foot long catamaran with capacity for 460 passengers. They run 2 ferries daily with departures from La Ceiba to Roatan at 9:30 am and 4:30 pm. 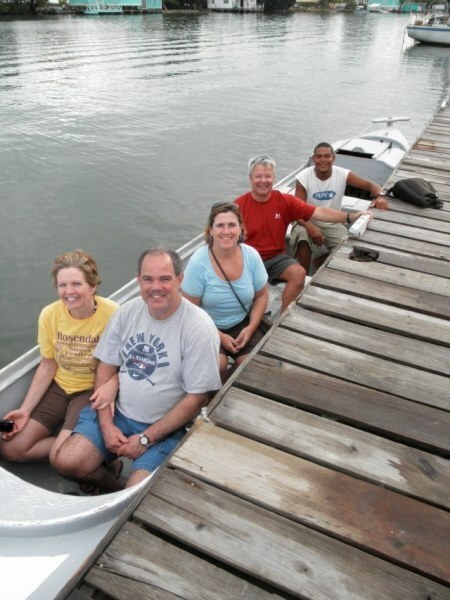 Ferries leave Roatan for La Ceiba at 7:00 am and 2:00 pm. The ferry takes approximately 1 1/4 hours. The fare for a regular adult ticket is approximately US$33 one way/US$65 round trip and for a regular adult first class ticket the fare is approximately US$38 one way/US$75 round trip. Galaxy Wave Ferry from La Ceiba, Honduras to Roatan. Photo courtesy of Galaxy Wave. I have never taken the ferry. We were scheduled to take it but then found out it didn't run on New Years Day so we hopped on a plane instead. The ferry can be somewhat of a rough ride if the seas are churned up. Typically the afternoon run is less calm than the morning run. The ferry, particularly in the afternoon, has gained the nickname of "the vomit comet." So be forewarned if you get any type of seasickness. Make sure you take that medicine beforehand so it has time to be effective. 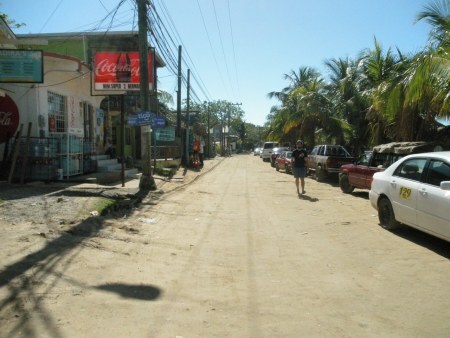 Roatan has a large selection of accommodations to choose from. Whether you want an all-inclusive hotel, a small guest house, an apartment or villa or a hostel, you can find it here. Many of the smaller hotels/guesthouse type accommodations and budget lodgings can be found around West End and West Bay. West Bay also has some bigger resorts, including all-inclusives such as the Henry Morgan Resort and the Mayan Princess. Larger resorts can also be found scattered around the island away from the hustle and bustle of West End and West Bay. The first time we stayed on Roatan it was a strictly diving trip and we stayed at Coco View Resort. We absolutely loved it there. It is about midway down the island and is pretty much its own little destination (you take a very short boat ride to get there once you arrive at the dock). We had a room over the water which, while basic, was very nice and comfortable. The meals were included and were always tasty. Of course, Coco View is all about Roatan diving. The scuba diving was wonderful and you could do as many shore dives as you wanted and when you wanted. You also had the option of doing a couple of boat dives per day. There was a wall right in front of the resort and made for some wonderful dives. As I said previously, we stayed there many years ago but the resort continues to get high marks from guests. You can check out recent reviews of Coco View here (at our partner's website). The last couple of years we have stayed in Sandy Bay which is more residential and about a 10 minute cheap cab ride to West End. We rented a 2 bedroom villa at Seadancer Villas (their website doesn't appear to be up any longer but they do have a Facebook page (https://www.facebook.com/roatanseadancer/) and I see some individual owners listing their units on Airbnb). The villas here are "rustic" so don't go looking for luxury. However, they are very clean and are located right on a beach with a pier that goes out over the water. A short swim from the pier is a reef where you can do some great snorkeling. The beach isn't the best for swimming since there is seagrass but an area has been cleared at the end of the pier so you can take a relaxing dip. When we wanted some "real" beach time we would take a taxi to West End and then a water taxi to West Bay. It just adds to the feeling of getting away from it all. Seadancer is very quiet and we loved it there (obviously since we went back the next year). The villas come fully equipped, including kitchen, so you can stock up and do your own cooking if you like. A fish truck with frozen selections of lobster, shrimp, fish, etc. usually visits Seadancer once or twice a week. We always stocked up and had some great meals. There is a restaurant within walking distance down the beach called the Blue Parrot. It has good food and drinks and is popular with expats. For reviews of the Blue Parrot, click here (located at our partner's website). There used to be a restaurant/bar, Sunshine Cafe, located a couple doors down from Seadancer but, unfortunately, that has since closed. You can still rent rooms there though (Hobbies Hideaway) which are very nice and well appointed. I haven't stayed there but I have taken tours of the rooms. It is located just down from Seadancer and shares the same beach and pier. You can find reviews of Hobbies' Hideaway here. I know John and Sue, the owners, and they do go out of their way to make the guests feel comfortable such as taking them to the store to stock up on groceries, taking them out on their boat for some snorkeling, arranging tours of the island, etc. Also a short walk down the beach from Seadancer are 2 other rental apartments on the bottom floor of a house. The owners live upstairs and they rent out a 1 bedroom and 2 bedroom apartment. I haven't seen the apartments but I have spoken with people who have stayed there and have been more than happy. I also know the owners here (can you tell it is a small community?) and they are nice people and do all they can to make your stay enjoyable. You can read reviews of Captain Rons Hideaway here. I will note that these 3 lodging choices on Sandy Bay are quiet and probably best suited to those that don't need to be catered to and like to be independent. 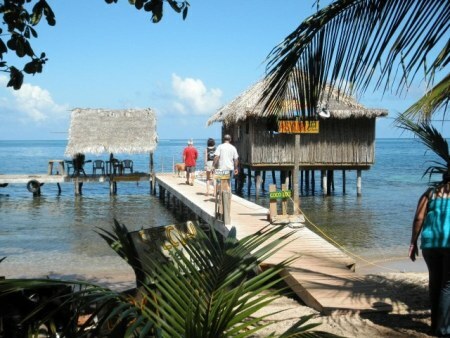 Another popular spot, particularly for those coming for the Roatan diving is Anthony's Key Resort. While we didn't stay there we toured the grounds, took in the free dolphin show and had a couple of drinks. The grounds at Anthony's Key are very nice and the dive operation is top-notch. Relatives of ours have stayed there and they only had high marks for the room, food and diving. I would venture to say that Coco View and Anthony's Key are the two most popular dive resorts on the island. Anthony's Key is located between Sandy Bay and West End so it is easy to get a cab into town if you want to take some time off from your diving. It also has a recompression chamber on premises, hopefully an amenity you will never have to use. 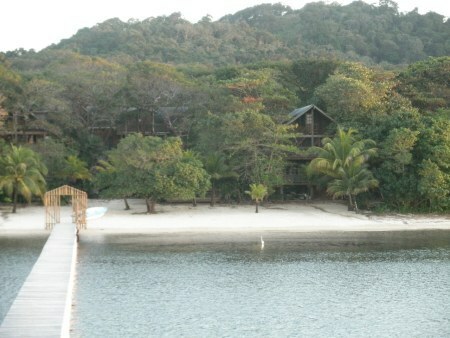 These are the lodgings we have the most first-hand experience with on Roatan. 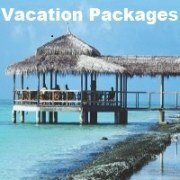 However, there are tons of options for hotels and other types of accommodations on Roatan. For the most highly rated lodgings on Roatan, you can check reviews on our partner's site here. Don't forget to check the tabs that say "B&B and Inns" and "Specialty Lodgings" for even more choices of places to stay on Roatan. Weather is a big draw in Roatan with pretty consistent temperatures year round. Winter time temperatures average around 82-84F for a high and about 77-78F for lows. Temperatures in the summer warm up a bit to 87-89F for the high and 80-82F for the low. The rainy season runs from around October or November through to February with most rain occurring October-January. We only had 3 days of rain during the day during our first month. But when it came down, it came down. Here we are escaping to town - we needed to get out of the cabin and have a cold one! That being said, you never know what you are going to get. 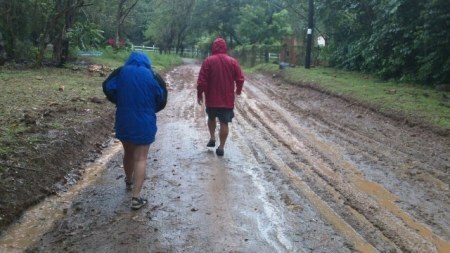 The first January we spent on Roatan was extremely dry with only about 3 days of rain during the day. Of course, 2 of those days were torrential downpours where we were holed up inside all day. The next January we were on Roatan and it was a different story. We had quite a bit more rain during the day and it led to some flooding and roads washing out. So you never know. Like the rest of the region, hurricane season in Roatan runs from June 1 to November 30. Many storms, however, turn north so the island isn't usually in a direct path of hurricanes. The last major hurricane to hit the island was Hurricane Mitch in October 1998. The island is, however, impacted by tropical storms. Tropical Storm Richard buffeted the island with 70 mph winds as it made its way north in October 2010 and Harvey went by with 60 mph winds in August 2011. Water temperatures are pretty much a delight and make Roatan diving very comfortable. During the summer months, water temperatures are in the bathtub like range with average temps of 84-86F. Water temperatures gradually cool off as winter approaches but the water is still far from cold. During the winter average water temperatures are still a respectable 77-79F. We dove January-March and the water was in the 78-80F range. I don't tend to get cold if I am only doing a couple dives a day and I was fine with a skin. If you are doing more diving or tend to get cold, a 3mm wetsuit or shorty should be sufficient. Visibility is usually very good in Roatan with average viz being in the 70-80 foot range. Looking at our logbook for the dives we did, on the vast majority of the dives we had visibility in the 60-80 foot range. Roatan is surrounded by reefs close to shore making it a scuba divers mecca. Unless you are going to dive on the other side of the island from where your boat is departing from, the majority of dive sites are a short boat ride away (most are less than 10 minutes). Most Roatan diving is done on the northwest side (encompasses West Bay, West End and Sandy Bay) and southeastern side (between Brick Bay and Oak Ridge) of the island. 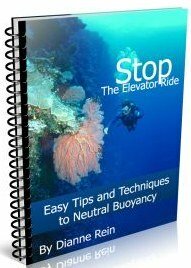 Most travelers that stay in West End/West Bay or come in on a cruiseship will do their diving on the northwest side. Visitors that stay at the popular dive resorts on the southern shore of the island, such as Coco View, Fantasy Island and Barefoot Cay will do most of their diving on that side of the island. A group of dive operators and businesses helped form the Roatan Marine Park in 2005. Their area of patrol now encompasses both of the above mentioned highly popular diving areas. One of the primary goals of the marine park is to help protect the fragile reef system around Roatan in concert with sustainable livelihoods. With all the development, tourism, overfishing, etc. on Roatan, I will say it is not an easy mission and they are doing an admirable job. The marine park now maintains approximately 90 mooring buoys at various dive sites around the island. 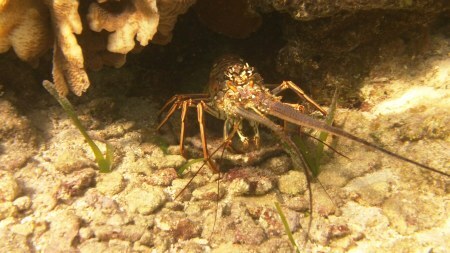 There are over 40 dive sites in the West Bay-Sandy Bay area of the marine reserve and over 30 dive sites on the southern side of the island. Needless to say, you won't get bored with the same old dive sites here. When we came back the second year, we never repeated a dive we did the year before. It wasn't even planned that way but luckily it worked out well. The reefs on the southern side of the island are closer to shore than the reefs on the northern side. They are, for the most part, easily accessible from shore. When we were staying at Coco View, you had 24/7 access to diving since all you had was a short swim out from shore to a beautiful wall. It really is a divers dream. Located near Coco View on the southern shore is arguably the most popular dive site on Roatan - Mary's Place. We remembered this site as a highlight of our trip there about 20 years ago. Although we stayed on the northern shore when we recently returned, we were lucky enough to be able to dive Mary's Place again. It did not disappoint. I still count it as the best dive site on Roatan. It really is spectacular. If you are staying on the north shore, sometimes the dive shops there will run a special boat trip over to the southern side of the island with a dive at Mary's Place on the itinerary. You do a couple dives and then typically stop for lunch. 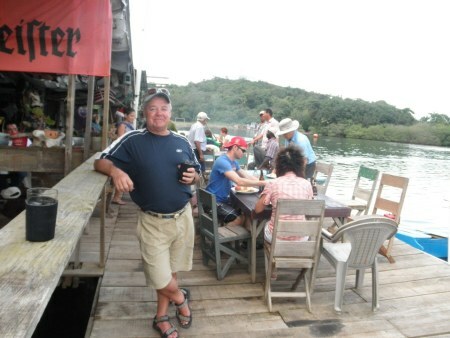 A popular lunch stop is the ramshackle "Hole in the Wall", accessible only by boat. It reopened after the death of its original owner and is getting good reviews once again. Go for the unique atmosphere, food and cold drinks and enjoy yourself. The diving on both sides of the island is good to very good in my opinion. If I had to pick one side, I would say the diving on the southern side comes out ahead of the diving on the northern side. That is not to say that there are not good dives off the northern shore. There are some very good sites there and I wouldn't hesitate to dive that part of the island again. Roatan, though, like most of the Caribbean has been adversely affected by weather, disease, development, etc. Some sites are better than others and from my limited experience (for what it is worth) it appears the south side may have held up better. No matter what side you stay on, there are a range of dive sites suitable for different levels of experience. 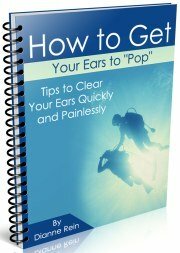 If you are a beginner, there are plenty of options to choose from. 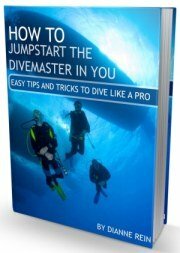 Discuss your experience with your divemaster prior to going out to make sure the dive is appropriate for you. Roatan diving offers walls, reefs, canyons and wrecks so no matter what interests you, you should be able to find suitable dive sites. There are no shortage of dive shops to choose from on Roatan. If you are staying at one of the resorts, such as Fantasy Island, Coco View, etc. they, of course, have their own in house dive shops. If you are staying at lodgings without a dive shop or coming in from a cruise ship for the day, your choices of shops can seem overwhelming. West End and West Bay have countless options. It may be helpful if you do some research prior to arriving at the island to see what shop appeals the most to you. Read some reviews, email the shop with any questions, etc. to get the ball rolling. Once you are on the island, if you haven't picked a shop yet it is easy to walk from shop to shop talking to employees/divers and asking questions until you hit upon one that is a good fit for you. 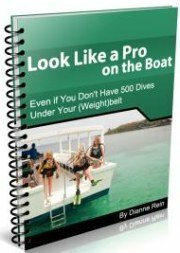 Some dive shops are more popular than others and may require advance reservations to guarantee a spot on the boat. So inquire ahead to see if this is the case. There is nothing worse than showing up and not being able to get on the boat. Of course, you could hit another shop but that entails registering, etc. again. On our recent trip to Roatan, we first dove with Coconut Tree Divers. They are a very popular dive shop and have many divemasters in training studying with them for their certification. It can make the boat/shop a bit crowded at times. We ended up doing 3 dives with this shop. The people were nice and we had no problem with them but then they had an engine problem with their big dive boat. We had to switch to the small dive boat and it was probably the most uncomfortable I have ever been on a dive boat. There were way too many people crammed into the small space. It was a challenge to find a place for your gear and a place to sit. That wasn't for me. Time to try another shop. Their boat was out of commission for several days so I was glad we switched. If the big dive boat was working we likely would have been fine with this shop. 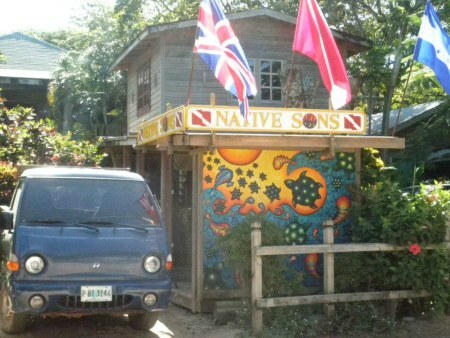 The next dive shop we used was Native Son Divers and this is the one we dove with for the rest of our time on Roatan (and our trip back the following year). The Native Son Dive Shop, located in West End. Take a right when you hit the main road running along the water. Native Son has a big, comfortable boat and a smaller boat. With the exception of one dive (I believe) we were always on the big boat which made for a relaxed time. The dive operation is very well run and the divemasters are friendly and professional. I wouldn't hesitate to recommend this shop to anyone. The one drawback to Native Son is that they don't have a dock so you have to walk out in the water to get to the boat and to get back to shore. Before diving it is not so bad but once you are done and are nice and warm after a dive, it can be a bummer to have to go back in the water. Of course I guess it wasn't that bad because we kept on diving with them. These are the two shops that I have personal experience with. I have friends that have dove with several different shops on Roatan and everyone seems to be pleased with their choice. So take a look around and see what shop you feel most comfortable with - you are bound to find one that will make you happy. Prices for Roatan diving are relatively inexpensive. In fact Roatan and Utila (another Bay Island) are known as some of the cheapest places to get certified. 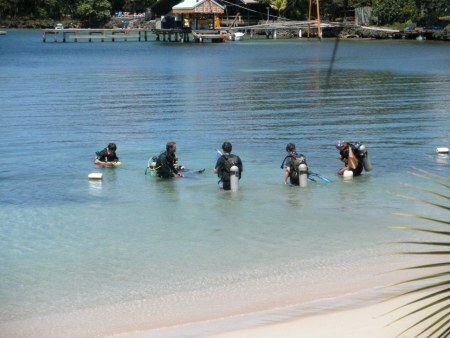 That is why you will see so many students here - for both open water and divemaster certifications. For the recreational diver, most dive shops will give you get a discount the more dives you do. 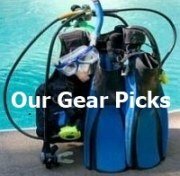 If you are doing a single dive, prices are in the $35/dive range plus $5 for equipment rental. Between 3-9 dives, prices typically drop $5/dive so a dive would be $30 + equipment rental. Once you do 10 or more dives, most shops charge $25-$30/dive including equipment rental. 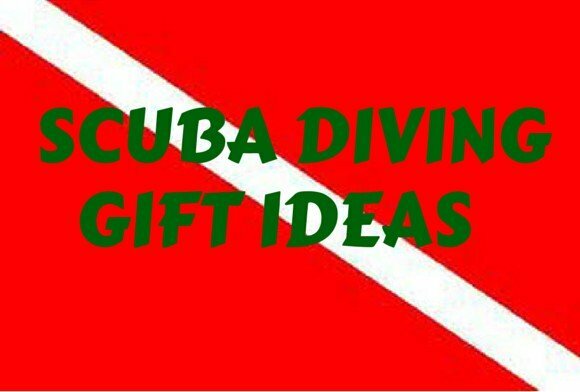 Since we did alot of diving, this is the deal we got and we thought it was very reasonable. I will be adding a page with reviews of the dives we did, so stay tuned! 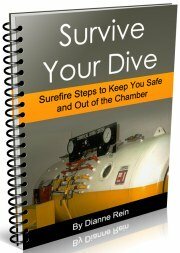 There are no shortages of things to keep you busy if you have had your fill of diving. 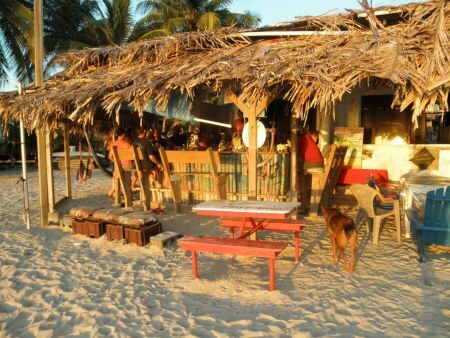 On a regular basis after a day of diving, we tend to retire to our favorite beach bar - what else? Nothing tastes better than an ice cold beer after diving and being in the sun all day. So where do we go? The Pink Seahorse Bar at Sueno del Mar in West End. As you are facing the water, you go all the way to the left and you will eventually hit Sueno del Mar (right before the Barefoot Bar). Walk through what essentially looks like a construction zone and over the little wall to the beach. There you will find the Pink Seahorse and Tita, the best bartender on the island. Tell her Dianne and Tim sent you. We have had countless good times there and when we go back, it will be one of our first stops. Our favorite bar on the whole island - the Pink Seahorse tiki beach bar. If we feel like a full day outing, one of our favorite things to do is rent a 4 wheel drive vehicle and explore the rest of the island. Once you leave the western end, the island becomes much less developed and it is fun to discover new places. We normally go all the way out the eastern point of the island (or as far as conditions will allow; after a rainstorm the dirt roads can get tricky in spots) stopping at different viewpoints, attractions, etc. along the way. We usually always stop at the Asylum (also called La Sirena), basically a little tiki bar/restaurant built on a pier over the water. They have some of the best conch ceviche anywhere - and not just on Roatan. That and a nice cold beer make for a perfect lunch. Going into the Asylum for a cold drink after our long drive to the east end of the island. On your way out it is easy to stop at other attractions along the way. Just have a relaxing day hanging at one of the beaches. Doing a panga tour of the mangroves over near Hole in the Wall. See, we do do more than dive and drink! So no matter what you are in the mood for, you are sure to find something to satisfy you while you are on Roatan. You can also see more pictures of Roatan on our Facebook page (facebook.com/scubadivingsmiles). Want to know where else we like to go scuba diving? Check out our picks for best diving in the Caribbean.